Well, things sure do change, huh? As some students who survived the tragic shooting at Marjory Stoneman Douglas High School in Parkland, Florida on February 14 peddled gun control, it’s looking as if school safety and government incompetence are more pressing issues. The former is where common ground on solutions in preventing future school shootings could be found. The latter seems to be how this was allowed to happen. The shooter, Nikolas Cruz, was a troubled individual, a nightmare at school disciplinary wise and threatening at home. The police were called to his home well over 20 times. The FBI and the Broward County Sheriff’s Department were warned about Cruz being a potential threat, specifically citing him collecting weapons and possibly being a school shooter in the making at the time. His self-mutilation should have triggered Baker Act protocols in which an individual is involuntarily taken to an approved state facility for mental evaluation. This is cited and appears on a background check. If this had happened, Cruz could very well have been prevented from buying an AR-15 rifle a few days after he was expelled in February of 2017. Every additional story on how perceived layers of societal protection failed these kids depresses the hell out of me. It's like this guy fell through multiple levels of cracks due to what I can only describe as institutional apathy. Sheriff Israel is not law enforcement... he is an elected official... a politician. Obviously. Israel's hiring practices have been criticized by his political foes since his 2012 election, but the controversy has moved to the forefront this year as he runs for re-election. He faces three fellow Democrats in the Aug. 30 primary; the winner faces a Republican in November. A log of employees hired by the sheriff shows 10 workers were hired since 2013 into "outreach'' roles, their salaries totalling $634,479. The unit is embedded into a $2.4 million community services division. When the budget year closes out in October, the outreach team expects to have made contact with 320,000 people, budget documents say. Israel's opponents say he's built a publicly funded political machine, paying back supporters with jobs and using them to keep him in office. They say the money could be better spent, particularly after the sheriff complained about not having enough funding to secure the county courthouse, where a murder suspect recently escaped. And therein lies something that’s at times glossed over, though The Washington Times’ Larry O’Connor pointed it out—Israel is a politician. He also won re-election handily in 2016. "I've exercised my due diligence, I've led this county proudly as I always have," he said. "We have restricted that deputy as we look in to it. You know, deputies make mistakes, police officers make mistakes, we all make mistakes, but it's not the responsibility of the general or the president if you have a deserter. You look into this. We're looking into this aggressively, and we'll take care of it and justice will be served." 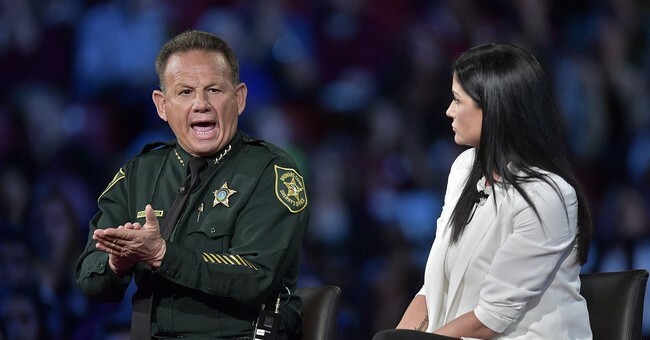 "Are you really not taking any responsibility for the multiple red flags that were brought to the attention of the Broward Sheriff's Office about this shooter before the incident?" Tapper asked. "Jake, I can only take responsibility for what I knew about. I exercised my due diligence. I've given amazing leadership to this agency—" Israel started. "Amazing leadership? Tapper asked incredulously. "Yes, Jake. There's a lot of things we've done throughout this—this is—you don't measure a person's leadership by a deputy not going into—these deputies received the training they needed—" Israel said. "Maybe you measure somebody's leadership by whether or not they protect the community," Tapper said. GEORGE STEPHANOPOULOS, Host: A lot of people wondering how a shooter like this could get an AR-15. As you know, there’ve been many calls to ban semi-automatic weapons, including most recently from Republican Congressman Brian Mast of Florida, an army veteran, lost both his legs in Afghanistan, a long-time NRA member. He says it’s time to have a ban. Let’s look. REP. BRIAN MAST (R), FLORIDA: I carried an M-4 carbon. Very similar to an AR-15. I was carrying that weapon on the battlefield in the most dangerous country on earth for one reason, because of it’s lethality. And my community and my kids and our schools, I don’t think that they’re made safer by the -- the general population of civilians having unfettered access to the best weapon the army could put in my hands. STEPHANOPOULOS: What’s your response to Congressman Mast? LOESCH: It is. And under Florida law, they actually had the authority to go and arrest that individual before anything could be done and I wish that as much attention were given to the Broward County Sheriff and their abdication of duty as trying to blame 5 million innocent law-abiding gun owners all across the country for this. LOESCH: No, there has been, though. STEPHANOPOULOS: All I’m asking is your position on the AR-15. LOESCH: There -- I know, but there has been. I think it’s very important. The AR-15 is a semi-automatic rifle. And I want to remind everybody that when you had a former Bernie Sanders staff member who tried to shoot up a baseball field full of congressional members with an SKS, it was that security that used their handguns to take down that individual. Now as far as an AR-15, this is semi-automatic. People keep calling these weapons of war. This thing originated in the civilian market before it was adapted by the military. This is really a discussion about banning all semi-automatic firearms. And I wish that we could be genuine in our discussion of that. That -- that’s the position on AR-15. And AR-15s are going to be in that school protecting students and teachers when they return back to class. But as far as banning on semi-automatic firearms, I think people need to just come out and say that that’s what they’re really talking about instead of AR-15. Yeah, this conversation is probably not going to happen. I did have hope; President Trump’s meeting last Wednesday with educators, survivors of mass shootings, and family members of the victims was grounded, respectful, and offered some insight into possible solutions. They were mostly grounded into armed guards at schools and better security to prevent would-be shooters from easily accessing school facilities. That sense of hope died during CNN’s two-minutes of hate rally in Sunrise, Florida, where the NRA, Second Amendment supporters, law-abiding gun owners, and Republicans were tried and convicted by a mob of anti-gun liberals. It was a kangaroo court, an Orwellian clown show that was quite revealing as to where this side rests in the gun debate. Its time to start stacking sandbags, folks. We’ll get through this, but this renewed assault on our civil rights is going to be the most concerted and aggressive in recent memory. When did you find out that Deputy Peterson had not gone into the building? How soon after the shooting did you know that?" Tapper asked Israel on "State Of The Union." "Not for days," Israel said. "How many days?" Tapper asked. "I'm not sure," Israel said. Tapper noted Israel had spent much of the town hall "attacking the NRA, saying that police need more powers," and that he didn't disclose any of the information about his deputy's dereliction of duty to the Stoneman Douglas community. "Did you know it then? Did you know it Wednesday night?" Tapper asked. "It was spoken about earlier during that day," Israel said. "I'm not on a timeline for TV or any news show. We need to get it right. We need to get it accurate. We're talking about people's lives." Israel said he looked at the tape on Thursday, the day after the town hall, to verify what he had heard about Peterson's inaction. That day while announcing Peterson's suspension and retirement, he said Peterson's conduct made him sick to his stomach. "One week after the shooting, you hadn't looked at the video yet?" Tapper asked. "I looked at the video as soon as our investigators—it wasn't my job to look at the video. It was investigators' job to look at the video," Israel said. "I'm still sheriffing this county."